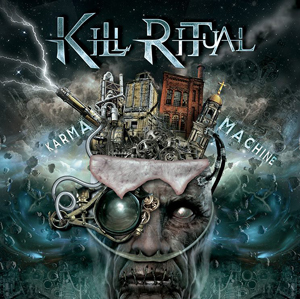 Karma Machine, the new album by KILL RITUAL, is complete and the band has now revealed its details. Encompassing 10 tracks the CD finds the band going from the heavy to melodic while retaining their thrash roots. It was once again produced by guitarist Steven D. Rice and mixed/mastered by KING DIAMOND guitarist Andy LaRocque. Artwork was completed by longtime KILL RITUAL artist Jobert Mello. The CD also marks the debut of new vocalist David Reed Watson and drummer Koryun Bobikyan. Check out "The Enemy Inside" lyric video below.